Royal Caribbean’s Serenade of the Seas hasn’t been having a good time no thanks to a broken water pipe which has caused delays, power failure and slight damage to the cruise ship that began on Friday night Jan 23rd. According to reports a broken water pipe onboard the 90,090 gross ton vessel caused some electrical damage after flooding an area of importance. In turn this resulted in the Serenade of the Seas briefly loosing power to some parts of the ship. Royal Caribbean has said that the medical facility, main Theatre, Gym and many staterooms had been affected by the power loss. The power failure also affected television systems across the ship. A passenger onboard Serenade of the Seas was giving updates via the Royal Caribbean Crown & Anchor Society Facebook group. The ship was not allowed to depart it’s homeport in New Orleans until the United States Coats Guard had cleared it. On Saturday morning when passengers were arriving to board there was still no power at the front of the ship. The USCG was inspecting onboard before Serenade of the Seas could be cleared for departure. Hello, this is Royal Caribbean International. We would like to provide you an update regarding your sailing today onboard Serenade of the Seas out of New Orleans. The U.S. Coast Guard is currently onboard inspecting the ship. We are waiting for authorization from the Coast Guard to begin boarding. Because the cruise terminal in New Orleans is very limited in space, we ask that guest explore the local area until we can begin boarding. We will contact you again once we have received permission to begin the boarding process. We appreciate your patience and understanding, and we look forward to welcoming you onboard. Hello, this is Royal Caribbean International with an update your sailing today onboard Serenade of the Seas. The U.S. Coast Guard has given us permission to begin the boarding process. Please return to the terminal so that we may check you in for your cruise. Our entire onboard team look forward to welcoming you onboard, and will do their very best to make your sailing as enjoyable as possible. Passengers who were unable to board have been given a full refund and 100 percent credit for a future cruise with the Miami based cruise line. 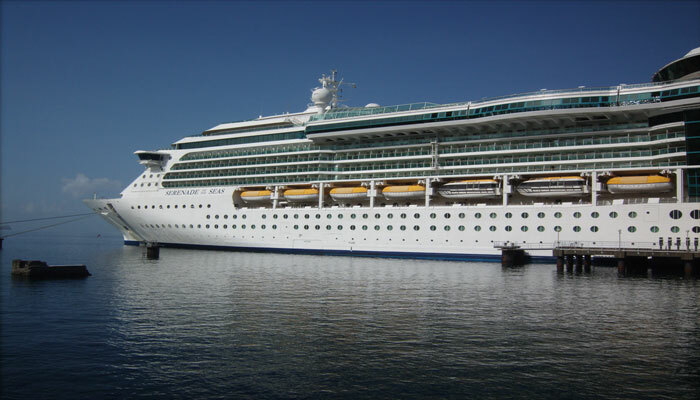 Serenade of the Seas was scheduled to depart on Jan 24th on a seven-night Bahamas cruise. Included in the cruise are stops at Key West, Nassau, CoCo Cay and then arriving back in New Orleans on Jan 31st. Due to the damage caused by the broken pipe there is a delay. The ship spent an overnight in New Orleans so ship engineers could repair the problem. Last night, Serenade of the Seas experienced a water pipe break that flooded some electrical equipment onboard. All of the ship’s critical systems, including navigation, are operational. However, a few areas of the ship are without power. These areas include the main theater, medical facility, gym and the television in guest staterooms. Our team onboard is working to restore power to these areas as quickly as possible. Unfortunately, a number of guest staterooms are affected by the power outage. It is with much regret that it was necessary to cancel some guests’ reservations. We understand the anticipation and excitement leading up to their cruise, and we apologize for impacting their vacation. Royal Caribbean International will provide these guests with a full refund of the cruise fare paid. Royal Caribbean would also like to provide these guests with the opportunity to sail with us again. We will be providing them with a future cruise certificate for 100% of the cruise fare paid for their sailing. The U.S. Coast Guard is currently onboard inspecting the ship and will decide when the ship will be able to sail. Until we receive clearance from the U.S. Coast Guard, Serenade of the Seas will stay alongside in New Orleans, Louisiana. Cruise Hive will keep readers informed and updated on this developing story along with upcoming delays for the current cruise and the next.